PrintInitiation Program - What is it? The Minor Hockey Alliance believes that young players who learn the skills of the game and have fun are more inclined to enjoy playing. If they have the skills to play, they will love the game, and want to keep playing the game. Hockey Canada developed the Initiation Program to make children's first contact with hockey a safe and positive experience. It's a structured, learn-to-play hockey program designed to introduce beginners to the game's basic skills while having fun. It enables participants to become contributing members of a team effort, develop self-confidence, and experience a sense of personal achievement. These goals are achieved in an atmosphere of fun and fair play. The Initiation Program is Hockey Canada’s premiere ‘Learn to Play’ program and is the foundation of skills development for hockey in the Minor Hockey Alliance. 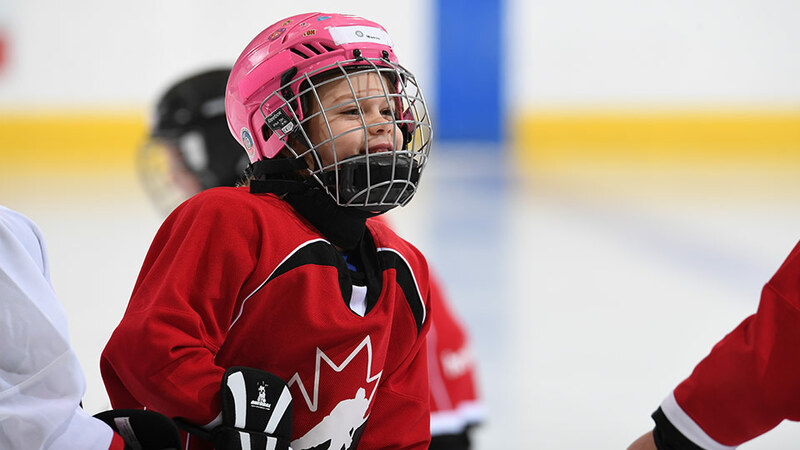 The Hockey Canada Initiation Program is designed for players 4, 5, 6 and 7 years old and clearly lays out how to get them started in hockey, so that they will again: have fun; learn skills, and develop confidence. The program consists of four phases of instruction, designed for any entry-level hockey player, helping introduce the skills of skating, passing, puck control and shooting in a progressive manner. Half-ice / cross-ice hockey has always been part of the Initiation Program, but has not been implemented in the same way in every community – beginning in 2017- 2018 season, cross-ice / half-ice is mandatory at the Initiation Program levels because we want to make sure all kids are learning the basic skills in an age-appropriate manner, and following the same steps based on our long-term player development model. You don't put five-and six-year-olds on a full-size soccer pitch, or expect them to play basketball on a full-sized court with no height adjustments – hockey is no different. Half-ice / cross-ice hockey allows young players the opportunity for more puck-touches, which promotes greater opportunity for skill development (skating, puck-handling, shooting, passing) coordination and decision-making. Players on half-ice / cross-ice have been shown to receive five times more passes and take six times more shots than when they are on a full-sized rink. Small-area games are used at all levels of the game – including senior national teams and the NHL. The benefits of half-ice / cross-ice hockey go beyond player development; the special bumpers allow minor hockey associations to alleviate pressure around scheduling and ice-time availability by safely allowing multiple practices and games to take place on one rink at the same time. Practices will be full-ice split with one other team and games will be two (2) teams sharing the ice playing two or more separate games. » Initiation Program - What is it?